Range/Habitat: African sub-Saharan to South African grasslands, woodlands and savannah’s. 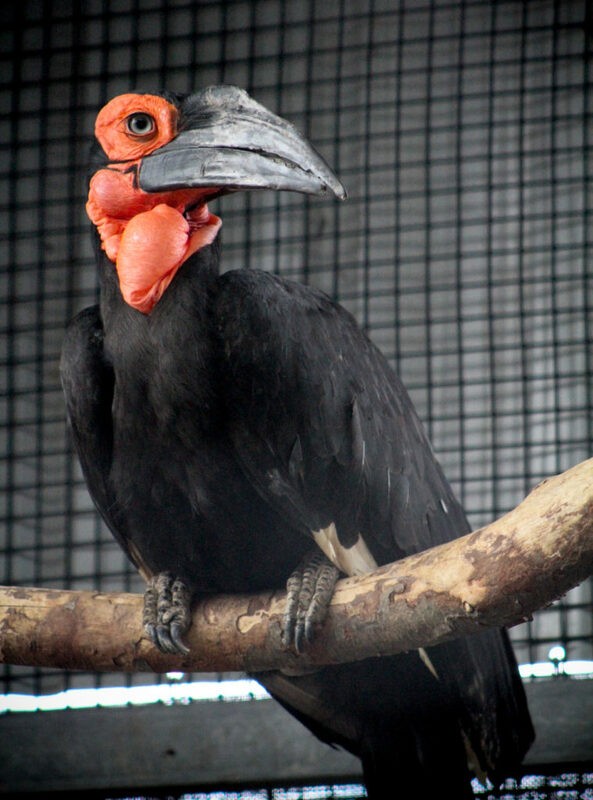 The southern ground hornbill is the largest of only 2 species of ground hornbills, weighing as much as 15 pound and having a wingspan of over 51 inches. Females are considerably smaller then males and have a violet blue patch on their throat. The red wattle on the neck can be inflated to make a booming sound ofter heard at sunrise. Southern ground hornbill groups are very vocal: contact is made by calls in chorus which can usually be heard at distances of up to 4 miles. The southern ground hornbill is a vulnerable species, mainly found in zoological facilities and national parks, but in Africa their range is limited at its western end by the lack of trees in which to build nests.